Most readers find this site by asking things like, does the Military Diet really work? Can I really lose ten pounds in a week? Is it safe? How does it work? Is it hard? What’s the menu and meal plan and how can I really crush it? The good news is, the Military Diet really can work. People have lost ten pounds in a week on the plan. There are valid criticisms, but for anyone looking to fit into that bikini or turn some heads on Spring Break, it’s not the worst road to take. This Military Diet guide explains the ins and outs, the menus, meal plans and science behind one of the world’s most popular diets. We’ve also got printable menus, substitution lists, results comparisons and healthier alternatives. Can you step up to the Military Diet challenge? Answer the call of duty and read on! The military diet actually has nothing to do with the U.S. military. It’s called “the Military Diet” because it’s very strict and disciplined, like a boot camp for your belly. Also like boot camp, it deprives you of the things you love to get you to a better place. The fact is ,the Military Diet actually can help a dieter drop ten pounds in a week. It doesn’t work that way for everyone and it’s not the best or healthiest way. It’s even considered dangerous and unsustainable, but more on that later. For a really awesome long term diet that could turn you into the greatest of all time, see our full guide to the Tom Brady diet plan here. With the Military Diet, dieters stick to a strict low-calorie meal plan for three days, then continue at a more relaxed pace for four days. It’s a 3-day diet in a sense, but the entire cycle lasts a week. Most dieters don’t hit the ten pound weight loss goal, but they generally lose at least two pounds and most fall in the 5-7 pound weight-loss range. For proof, see our “Military Diet Results” section below. The diet works by restricting calorie input drastically for three days, then more comfortably for four more days. It cuts calorie input in half for those first three days, then by about 35% the other four. As a multiplier, the diet uses flab-fighting foods like coffee, grapefruit and high-protein peanut butter, eggs and meat to ramp up its effects. There’s some science behind the claims, which we’ll explore later. 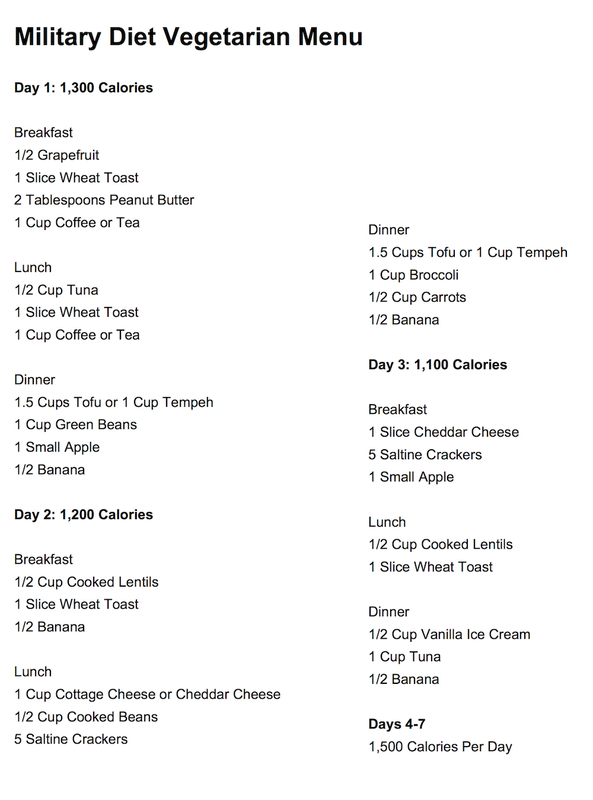 Three days: Average 1,100 calories per day. That’s about half the typical diet. 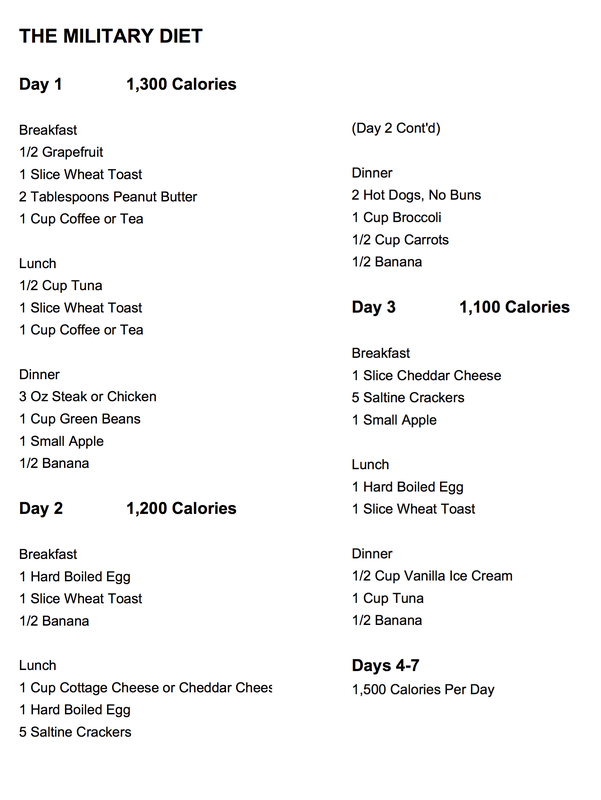 Four days: 1,500 calories per day. That’s about 2/3 the typical diet. Take at least a week off before repeating. Can You Really Lose 10 Pounds a Week? People really can and really do lose ten pounds in a week on the Military Diet. How much weight gets lost depends on will power. It also depends on other crucial triggers like exercise. A pound of fat translates to 3,500 calories. Without donning a lab coat and a pair of Buddy Holly glasses, that means a dieter must burn more than a day’s energy without replenishing it with food. Starvation diets work on the idea of calories-out and no-calories in, but they’re dangerous. The military diet splits the difference. To lose ten pounds in a week it’s not enough to cut down food. Exercise is crucial, and we’ll discuss that later. First the meal plan. 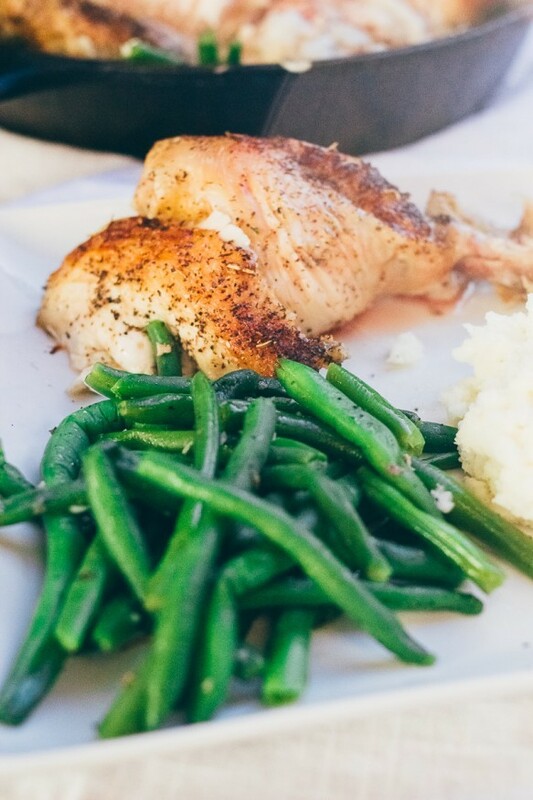 Without further preamble, here’s the Military Diet Meal Plan and menu. For a printable list, scroll down to the next section. Want to know why hot dogs are killing you right now? See our post on that right here. Click on the printable list below to see it up close. Right-click to print. For Military Diet substitutions, see the next section. 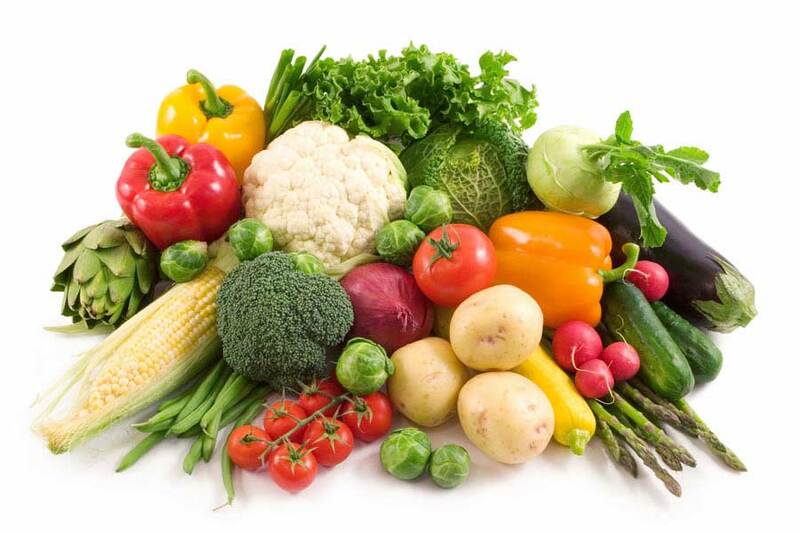 For vegetarian Military Diet substitutions, see the list at the bottom of this article. Regular run-of-the-mill swaps are right here. There’s a printable list of all subs below too. Just click to enlarge it, then right-click to print. Grapefruit: There aren’t many substitutes that mimic grapefruit’s fat-burning powers, but two choices are 1/2 tablespoon baking soda in a glass of water (yuck, right?) or one teaspoon whole apple cider vinegar in a glass of water. Wheat Toast: Wheat toast has several good swaps including 1/2 cup of oatmeal, 2 tortilla wraps or 1/2 cup of any grain like quinoa or cooked barley. Peanut Butter: Almond butter, hummus, bean dip, soy butter, sunflower butter. Coffee: Substitute green tea, black tea or hot chocolate, as long as all of them are sugar-free and milk-free. For a great list of coffee alternatives, see our article on that right here. Tuna: Chicken or other lean meat. Tofu, tempeh, cottage cheese, peanuts, almonds. Steak/Chicken: Beans, lentils, tofu, tempeh. Apple: Apricots, peaches, plums, pears. Google the calorie content of each and match it to a small apple. Banana: For half a banana, banana haters can substitute one kiwi, one apricot or half a cup of papaya. Two plums, two cups of grapes or a cup of applesauce work too. Egg: 2 bacon slices make a great egg substitute. Other options are a cup of milk, one chicken wing or 1/4 cup of seeds and nuts. Saltine Crackers: Instead of 5 saltine crackers choose rice cakes, wheat thins or Nuthins. 5 saltines = 200 calories, so check the calorie count on the package and match it. Hot Dogs: Turkey dogs, tofu pups, lunch meat, beans or lean meat. 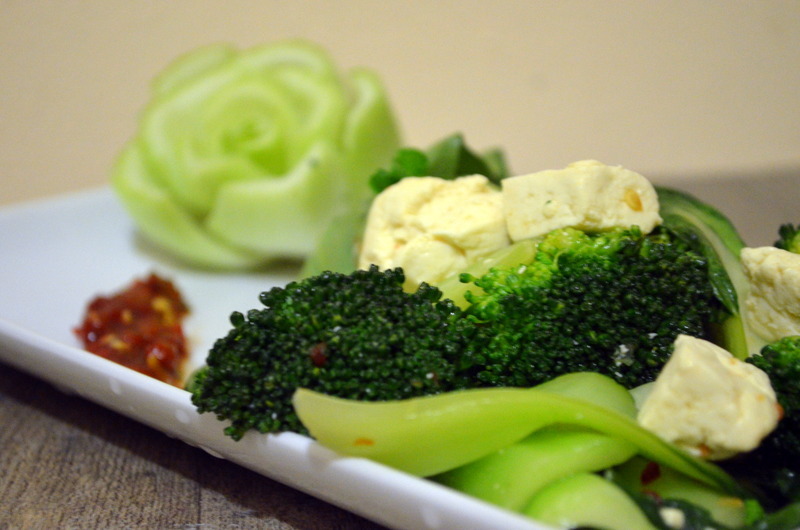 Cup Broccoli: Substitutes for broccoli include brussels sprouts, spinach, asparagus and cauliflower. Carrots: Parsnips make a great alternative to carrots. So do summer squash, zucchini, beets, celery and bell peppers. Cheddar Cheese: Replace cheddar cheese with eggs, ham, tofu, soy milk or cottage cheese. Vanilla Ice Cream: Who doesn’t love ice cream? For those who don’t, use yogurt instead, or apple juice. Looking for a more long-term diet to lose weight? Check out our guide to the hugely popular ketogenic diet here. We wanted to see what the results of the military diet are in real life. In other words, how much is hype and how much is hallelujah? We sifted through Pinterest and found 16 real-world reviews. In our sampling, most people lost 5-7 pounds. Some lost 0-4 and a few lost 7-10. Out of all 16 dieters, the average loss was 5.5 pounds. Keep in mind that those who lost zero or failed to stick to the diet probably didn’t share their results. What’s the difference between those who crushed the Military Diet and those who got crushed? It comes down to two main factors: starting weight and exercise, as we’ll see below. How Much Weight Will I Lose on the Military Diet? Someone who weighs 300 pounds eats about 3,200 calories a day to maintain their weight. The Military Diet cuts their intake to about 1/3rd of that. At that rate without exercise the dieter will lose 4 pounds in a week. Someone who weighs 160 pounds needs 2,400 calories to keep going steady. The military diet cuts that in half. That dieter will lose 2 pounds in a week sans exercise. By now it’s obvious that there’s another crucial part of the Military Diet: Exercise. One hour of walking burns about 250 calories. The average dieter who walks two hours a day will lose an extra pound on the Military Diet. Sound insurmountable? Consider working exercise into the daily routine. Walking or riding a bike can replace driving. Stairs are a good substitute for elevators and everything from house cleaning to yard work to shopping burns calories. There’s a great calorie/exercise calculator here. Take a multivitamin. Getting enough vitamins and minerals boosts energy, promotes health and can even curb the appetite. That’s especially important when cutting calories. Hydrate. Drinking plenty of water has a double benefit of helping the body shed fat while providing a full-belly feeling. Get plenty of rest. With less calories comes less energy. Solid sleep is crucial during the Military Diet. Never take on the Military Diet two weeks in a row. Take at least a one-week break between cycles. A word of warning: exercise will be extremely hard on the military diet. That’s because this diet depletes your energy reserves. 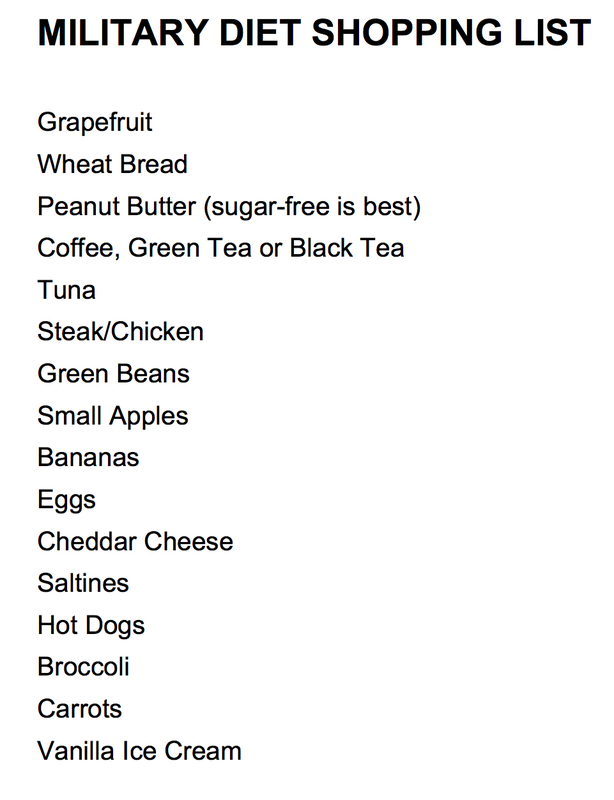 Here’s a handy shopping list for the Military Diet. There’s a printable version in the image below. Just click to enlarge, then right-click to print. Is the Military Diet Safe? The Military Diet should be safe enough short term. Long term is a different kettle of fish. Since the diet cuts out half of the typical calorie count, it’s considered a “crash” diet. However, it only lasts three days, which softens the blow. The diet uses vegetables and fruits so vitamins haven’t exactly boarded a plane to Timbuktu. That said, the nutrient supply is far from abundant and the unhealthy addition of hot dogs doesn’t help. All in all, the Military diet shouldn’t hurt anyone, provided it’s only followed for a week at a time. The one-week break in between is crucial. Following the diet long-term is both unhealthy and unsustainable. A bit like cutting off some toes because a pedicure went wrong. The Military Diet has no shortage of critics. It’s a crash diet that forces the body into starvation mode. It includes hot dogs, which are linked to brain cancer and colorectal cancer (yum)! 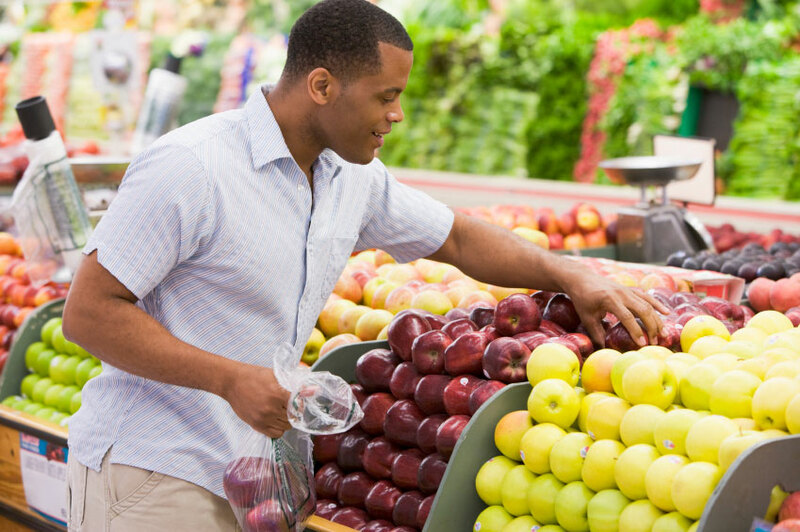 It doesn’t pack enough fruits and veggies and it sets up unrealistic weight-loss expectations. One major criticism of the diet is the promise to drop ten pounds in a week while eating ice cream. In the first place, the diet isn’t exactly an ice cream slot machine. It permits only a stingy cup of ice cream at the end of day three. Another criticism surrounds the results. Zillions of Pinterest shares notwithstanding, it’s incredibly hard to lose ten pounds in a week. In an effort to boost self-esteem and bragging rights, most Pinteresters probably avoid drinking water on weigh-in-day. That means a big chunk of the social media success out there is probably just water weight! By far, the best substitute for the Military diet is a meal plan that cuts out simple carbs and jams in a whole steamer-trunk of veggies and whole grains. Why? In a word, the veggie lover can cram his or her face comfortably full and still lose weight. Look, the goal is to lose weight, right? Goal #2 is to have a fully belly, to feel comfortable, to not feel deprived. The real secret is ,it’s easy to get the best of both world’s by picking the right foods. Below are a few dishes that make up a sampling of an Anti-Military-Diet. They’re easy to make, they’ll fill up any belly and they’ll power in the weight loss. Below is the Military Diet menu for vegetarians. For a printable list click the image below. The Military Diet claims to melt fat through a mix of calorie-cutting and fat-burning foods. While nutritionists largely give those claims a failing grade, there is some science lurking in the wings. Grapefruit does have some fat-burning properties. While it’s not a silver-bullet, anyone looking to shed a few pounds who doesn’t have to kill a werewolf will find grapefruit a staunch ally. Coffee contains caffeine, a staple ingredient of many diet pills. There’s science here too. Since caffeine speeds up the metabolism it sets fire to more calories. Meat, peanut butter and other high-protein foods take more energy to digest. More energy burned means more calories up the flue. As a multiplier, high-protein foods bestow a feeling of fullness. 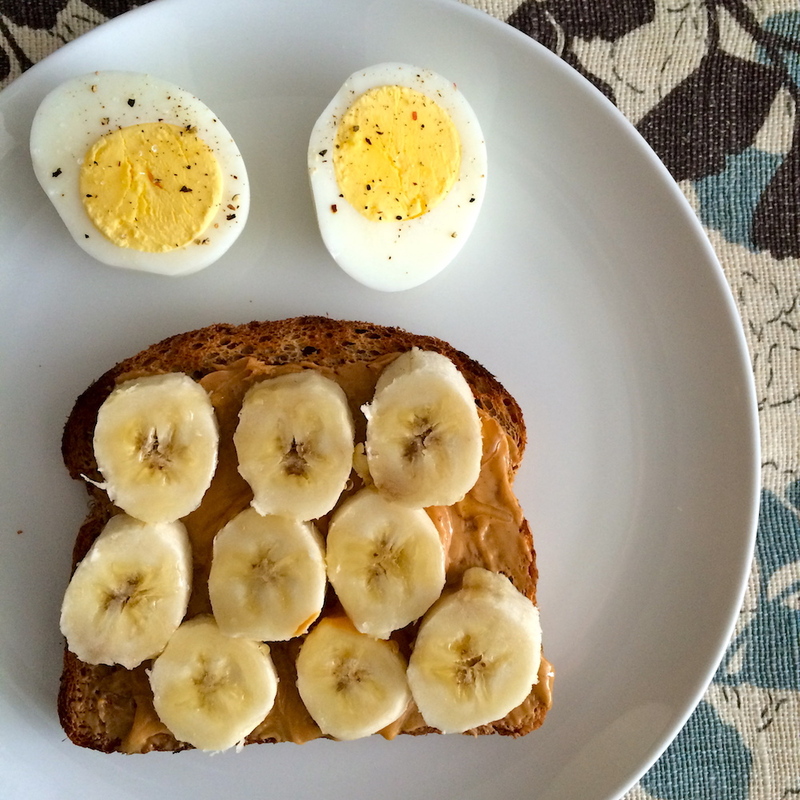 Though don’t expect to feel stuffed off a couple tablespoons of peanut butter! Short duration diets are less daunting and can feel more attainable. The idea of success can redouble determination at a time it’s sorely needed. Now Go Shed Those Pounds! Despite its failings, the Military Diet has helped scores of users win at short-term weight loss. We hope the meal plans, menus, substitution lists and tips provided here have helped. Want to share your Military Diet story, review or suggestion? Just chime in in the comments section. We’d love to hear your take on this fat-buster and we’d love to relish in your success story. Bon appetit!